As a professional counselor, I learned a lot about child development during my masters program. One of the things that has really stuck with me is the simple knowledge that children learn through play. This has led me to really think about ways to play “smarter” with Ayla. When I think about the values I want her to carry and the coping skills I want her to develop I have to also think about how to make these things tangible to her as a 1 ½ yr old. I have come up with a few activities to engage with her in play that has a greater purpose (all adaptable for older kids) and I’d love to share them with you! 1. Walks in the woods to promote mindfulness- Growing up around so much technology can be an incredible blessing but with it comes an increased need to set healthy life rhythms from an early age. Silence, contemplation and mindfulness are crucial to self-awareness and caring for your mental health. I think it’s incredibly valuable to teach kids the importance of unplugging and practicing mindfulness skills. Right now, as Ayla is not even 2 this may just look like helping her notice a beautiful flower or a caterpillar crawling by. As kids get older, spending time outdoors provides the perfect backdrop for teaching them to practice mindfulness. The goal of mindfulness is to promote focused relaxation where you become aware of your thoughts and sensations without judgement. When instructing someone on the concept of mindfulness the first step is to ask them to notice their thoughts, let the thoughts go, and then to draw their attention back to what they see and feel in and around them. You can ask your child questions like “What does the air smell like?” “what does it feel like to take a deep breath?” “What is the closest sound they hear and the farthest sound they hear?” You can direct them to look at a leaf close up and feel its tiny ridges while practicing being completely present and letting other thoughts go. Mindfulness has been proven to be an incredibly successful skill for managing stress and anxiety and building these skills into a toddler or child’s play routine can be an invaluable coping skill for later in life. 2. Art activities to promote creativity and fine motor skills- Did you know that research is starting to show that engaging in art activities may actually increase your child’s ability to analyze and problem solve? It also helps them to develop fine motor skills as well as increase their curiosity about how the world works. From mixing paint colors to choosing different kinds of paper and brushes kids are able to begin to use trial and error to grow in their understanding of how the world works. 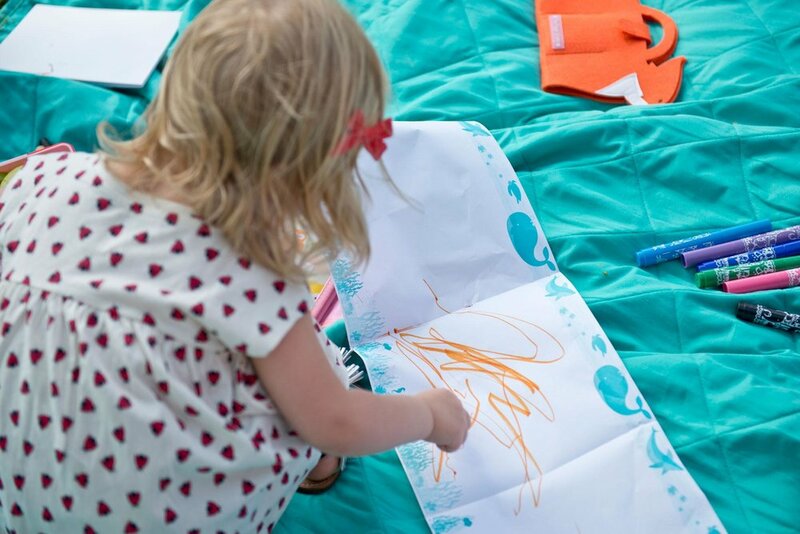 When your child is creating art it’s usually best to be less directive and ask questions about what they are creating and what their creative process is like to encourage experimenting and exploring. As they experiment and succeed at creating art children feel empowered and increase their self-efficacy. 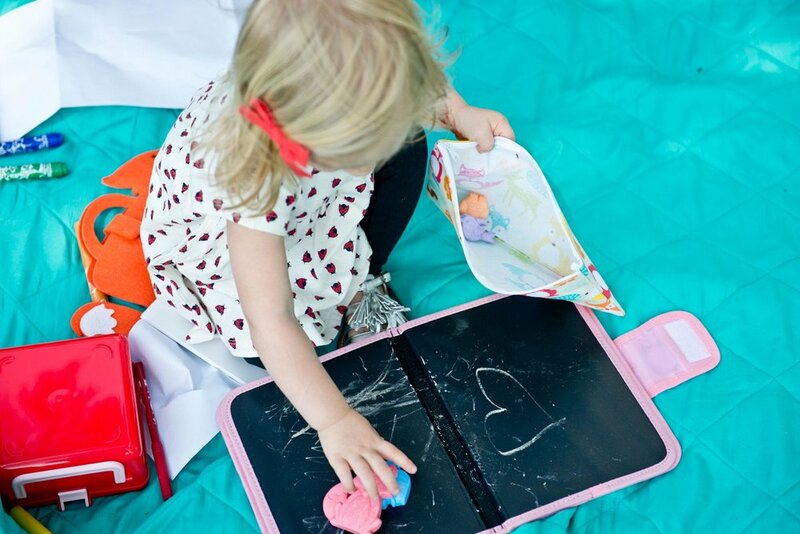 If your worried about the mess you can do what we often do when the weather is nice and set up a great big art station on a washable picnic blanket outside. 3. The “good gifts game” to promote strength focused thinking- This was a game I came up with out of necessity one day when I tragically forgot Ayla’s pacifier at home and the whining became more than I could bear. I started to think “What do I do to cope when I don’t have access to the thing I really want.” For me I realized that I usually take a moment to become aware of where I am operating from a “poverty mindset” of not having what I need or want and refocus my thoughts on all the amazing gifts God has given me. If your family does not profess a believe in God you can easily adapt this to simply focus on the positive aspects of your life. The game is simple. We start to look for everything we can that is a good gift and we thank God for it. We say thank you for the clouds and pretty flowers we pass or a cute puppy that was walking by. We say thanks for things like our friends, family, toys, snacks and anything that comes to mind. The reason this game is so important is because as humans, we are always thinking/talking to ourselves in our mind. These thoughts form an internal narrative. For some that is a positive and strength focused narrative while for others it is full of disappointment, anxiety, doubt and sadness. We live our lives based out of the narrative that we allow to play in our minds and the earlier we can help our children to recognize their feelings and challenge the thoughts that are causing those feelings, the sooner they will learn to live out of a strength focused narrative. A positive narrative has the ability to combat things like dissatisfaction, anger, depression and anxiety. I was amazed at how Ayla would go from sobbing because she did not have her pacifier to naming things she loves and is thankful for like Elmo and Bunnies. Her narrative changed from “my world will end if I don’t get a pacifier” to “It’s ok that I don’t have what I want right now because I have so many other things to be thankful for.” It’s a game I hope she never grows out of playing. I know it’s one I play on the daily and I don’t think I could ever get enough of it. 4. Farmers Market to promote healthy food choices- I believe that the more kids are involved in choosing foods and learning not only how to cook them but where they come from, the better choices they will make when it comes to their health. A great way to get kids more invested in what they are eating is to have them help pick out a farmer’s market friendly recipe, go to the market to choose the ingredients and then have them help to cook the meal. Doing a little google search to find out what nutrients are in each vegetable can add another level of learning to this activity. Before you leave the house have them help you choose the recipe you will make together. At the market you can do things like let you kids pick the tomato (or whatever your getting) and put it in the bag. As they are choosing the right tomato you can share with them simple facts (from your handy google search) like the fact that tomatoes have lycopene and lycopene helps keep us healthy by fighting cancer. Once home have them help to wash the produce and then cook in whatever age appropriate ways they can. This whole process is about as interactive a learning experience as you can get. Ayla is only 1 ½ but already we talk about going to the market to get veggies for our omelets. We talk about how veggies grow at a farm and I let her hold the vegetables as I shop. When we get home she helps me scramble the eggs (mostly by poking them with a fork while I beat the eggs lol). She loves the whole process and I am amazed at how she seems to be absorbing everything when I involve her in more intentional ways. 5. Explore a new town to promote discovery and adventure- One of my favorite activities is to explore a new place. For this activity get out a map (you know, the kind that your parents used to keep in the glove box and was made of real, tangible, hold in your hands paper) and find a location you want to explore. Turn your phone off and head out on an adventure. Let you kids choose what streets you go down, where you stop and even if you end up choosing to scrap your destination and end up in a totally different place than you thought. look for excitement and anything fun along the way. Maybe you find a fun park or you discover a cute ice cream parlor. Perhaps you find a trail and follow it into the woods to discover a beautiful stream. Where you end up is far less important than the process of enjoying the moment and being present. I am pretty sure that 99% of our lives we are in process and on a journey and yet we are so often living for that 1% of life where we arrive or attain some goal. Now don’t get me wrong, I am all about having goals and destinations. It’s great to allow goals and destinations to drive our direction in life but the problem often becomes that we focus so much on the end goal that we miss enjoying 99% of our lives. Being able to see the value of all the moments in between where we start and where we hope to end is a valuable skill that we can learn. It helps us learn to be more flexible and enables us to enjoy the moments we are given in life as we move towards our goals. 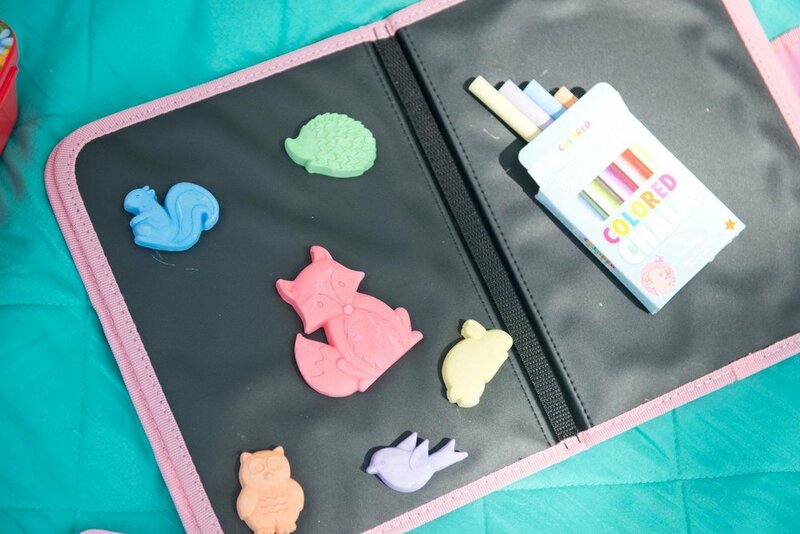 Also, I’m sure you are all wondering about the incredibly adorable art supplies as well as the cute owl backpack. They are from a small company called “The Piggy Story” who generously sponsored this post. Make sure you check them out as they have the cutest affordable art kits and supplies for children of all ages.